The American and Filipino forces fought from an untenable position until formally surrendering to the Japanese on April 9. 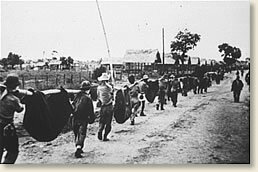 The Japanese immediately began to march some 76,000 prisoners (12,000 Americans, the remainder Filipinos) northward into captivity along a route of death. When three American officers escaped a year later, the world learned of the unspeakable atrocities suffered along the 60-mile journey that became known as the Bataan Death March. Japanese butchery, disease, exposure to the blazing sun, lack of food, and lack of water took the lives of approximately 5,200 Americans along the way. Many prisoners were bayoneted, shot, beheaded or just left to die on the side of the road. "A Japanese soldier took my canteen, gave the water to a horse, and threw the canteen away," reported one escapee. "The stronger were not permitted to help the weaker. We then would hear shots behind us." The Japanese forced the prisoners to sit for hours in the hot sun without water. "Many of us went crazy and several died." The ordeal lasted five days for some and up to twelve days for others. Although the Japanese were unprepared for the large number of prisoners in their care, the root of the brutality lay in the Japanese attitude that a soldier should die before surrender. A warrior's surrender meant the forfeiture of all rights to treatment as a human being. After the war, the finger of blame pointed to General Masaharu Homma, commander of the Japanese troops in the Philippines. Tried for war crimes, he was convicted and executed by a firing squad on April 3, 1946. "This was the First Murder"
Captain William Dyess was a fighter pilot stationed on Luzon when the Japanese invaded. Captured when the American forces on Bataan surrendered, he joined the Death March and was interned by the Japanese. 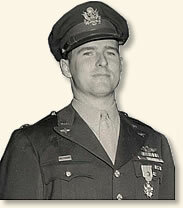 In April 1943, Captain Dyess was one of three prisoners able to escape from their captors. Captain Dyess eventually made his way back to America where his story was published. "The victim, an air force captain, was being searched by a three-star private. Standing by was a Jap commissioned officer, hand on sword hilt. These men were nothing like the toothy, bespectacled runts whose photographs are familiar to most newspaper readers. They were cruel of face, stalwart, and tall. 'Before we could grasp what was happening, the black-faced giant had swung his sword. I remember how the sun flashed on it. There was a swish and a kind of chopping thud, like a cleaver going through beef'. This was the first murder. . ."
"Eventually the road became so crowded we were marched into a clearing. Here, for two hours, we had our first taste of the oriental sun treatment, which drains the stamina and weakens the spirit. The Japs seated us on the scorching ground, exposed to the full glare of the sun. Many of the Americans and Filipinos had no covering to protect their heads. I was beside a small bush but it cast no shade because the sun was almost directly above us. Many of the men around me were ill. When I thought I could stand the penetrating heat no longer. I was determined to have a sip of the tepid water in my canteen. I had no more than unscrewed the top when the aluminum flask was snatched from my hands. The Jap who had crept up behind me poured the water into a horse's nose-bag, then threw down the canteen. He walked on among the prisoners, taking away their water and pouring it into the bag. When he had enough he gave it to his horse." "The hours dragged by and, as we knew they must. The drop-outs began. It seemed that a great many of the prisoners reached the end of their endurance at about the same time. They went down by twos and threes. Usually, they made an effort to rise. I never can forget their groans and strangled breathing as they tried to get up. Some succeeded. Others lay lifelessly where they had fallen. I observed that the Jap guards paid no attention to these. I wondered why. The explanation wasn't long in coming. There was a sharp crackle of pistol and rifle fire behind us. Skulking along, a hundred yards behind our contingent, came a 'clean-up squad' of murdering Jap buzzards. Their helpless victims, sprawled darkly against the white, of the road, were easy targets. As members of the murder squad stooped over each huddled form, there would be an orange 'flash in the darkness and a sharp report. The bodies were left where they lay, that other prisoners coming behind us might see them. Our Japanese guards enjoyed the spectacle in silence for a time. Eventually, one of them who spoke English felt he should add a little spice to the entertainment. On through the night we were followed by orange flashes and thudding sounds." "The sun still was high in the sky when we straggled into San Fernando, a city of 36,000 population, and were put in a barbed wire compound similar to the one at Orani. We were seated in rows for a continuation of the sun treatment. Conditions here were the worst yet. The prison pen was jammed with sick, dying, and dead American and Filipino soldiers. They were sprawled amid the filth and maggots that covered the ground. Practically all had dysentery. Malaria and dengue fever appeared to be running unchecked. There were symptoms of other tropical diseases I didn't even recognize. Jap guards had shoved the worst cases beneath the rotted flooring of some dilapidated building. Many of these prisoners already had died. The others looked as though they couldn't survive until morning. There obviously had been no burials for many hours. After sunset Jap soldiers entered and inspected our rows. Then the gate was opened again and kitchen corpsmen entered with cans of rice. We held our mess kits and again passed lids to those who had none. Our spirits rose. We watched as the Japs ladled out generous helpings to the men nearest the gate. Then, without explanation, the cans were dragged away and the gate was closed. It was a repetition of the ghastly farce at Balanga. The fraud was much more cruel this time because our need. was vastly greater. In our bewildered state it took some time for the truth to sink in. When it did we were too discouraged even to swear." This eyewitness account appears in: Dyess, William E., The Dyess Story (1943); . 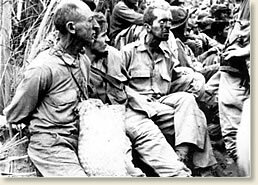 "The Bataan Death March, 1942," EyeWitness to History, www.eyewitnesstohistory.com (2009). Captain William Dyess, the author of this eyewitness account returned to the US in July 1943. He was promoted to Lt. Colonel and began training in a P-38 fighter plane in anticipation of returning to combat. On December 23, 1943, he was killed in an air crash while attempting to steer his burning plane to a vacant field near Los Angeles. Lt. Colonel, Dyess told his story to a correspondent from The Chicago Tribune from a hospital bed. The War Department initially prohibited the publishing of the story for fear it would lead to retribution by the Japanese to American prisoners. This ban was lifted in early 1944, after Lt. Colonel Dyess's death. His story was initially told through a series of articles in The Chicago Tribune and then as a book that became a best-seller.